Do you ever find yourself "in the meantime"? 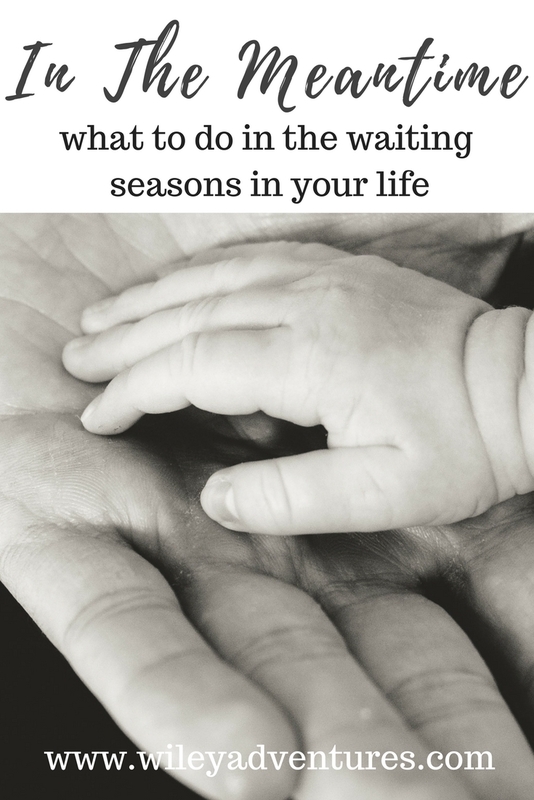 In a waiting season? Maybe you're waiting to go into labor. Maybe you're waiting on news from a job interview. Maybe you're waiting in the adoption process. Maybe you're waiting for relief from pain. Maybe it's a new season you're desperately waiting for. 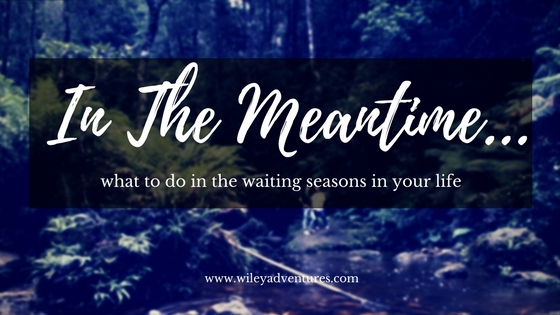 Whether you're waiting on the Lord, news, other people, or babies... whatever it is you're waiting for, the "meantime" sure can be a mean time can't it? My dad calls them the parenthesis times. The times in between the main narrative in your life. What are we supposed to do in those seasons? Obviously there's some patience involved. There is the actual, you know, waiting.... But where should our hearts rest? What should we be praying for? About three years ago I found myself in a pretty significant waiting room. We really felt like we had heard from the Lord that a change was imminent. We could feel the tides turning, but we didn't really know what the details were. We didn't know where the change was going to happen. We didn't the how or very much of the why. We had walked through a difficult time personally and emotionally. We were tired. We were weary. And quite frankly we didn't even know where the energy was going to come from for whatever it was that we were waiting on. In the middle of the raw weariness, I sought after the Lord and asked Him for a resting place. For something to hold onto while I waited. And I feel like He truly met me in that place and gave me three things to cling to. I think they are applicable across the board for these kinds of seasons and I want to encourage you with them, should you find yourself in a meantime. So when you find yourself weary in the waiting, remember to go to Him. He is the source of our patience, and the place to rest in the meantime. Over and over and over we find in Scripture, Godly men and women asking for blessing and favor from the Lord. (Abraham, Jabez, Hannah, David, Zacharias .... just to name a few). So why on earth wouldn't we ask for the same things. I really think the Lord delights when we ask Him for blessing. In fact, speaking of blessing, there's the familiar verse that says "Delight yourself in the Lord and He will give you the desires of your heart". This does not mean that if you ask God then He will give you whatever you want. He's not a genie. What it does mean, however, is that when you delight yourself in Him, when you spend time in His word, when you spend time praying and talking to Him, then He will direct your desires. He will give you the desires of His heart. The key is to, again, go to Him as the source of those desires. So while you're waiting, make sure you're waiting WITH Him, talking to Him and asking Him for blessing. Just remember to let Him define the blessing and TRUST Him to lead your heart in the meantime. This concept comes from the infamous chapter in Proverbs 31. The picture of this amazing woman laughing at the days to come is my favorite part of the whole chapter. This is a woman who is not afraid. And coming from someone like me who has battled fear and worry a lot of my life, I want so badly to be different. I want to laugh at the days to come. There are so many interpretations and commentaries on this chapter. But I heard a different take on it recently. Instead of being a list of things that the most awesome woman can check off her list, these words are used as a means of blessing. It's something that husbands used to speak over their wives as a blessing over them. I don't know about you, but I want to be a woman of blessing. I want to bless others and I myself want to be blessed. And here's the thing about this concept that occurred to me three years ago: It's a choice. I choose to fear my circumstances more than I fear the Lord and His power. I choose to bless others and to rest in the blessing. I can choose to laugh at the days to come, to not fear them, and so can you. Don't waste your parenthesis time. Cling to these three things while you wait, which in case you havn't caught on to this, means clinging to Christ Himself. This is my first Wednesday Words post... a place where I flex my writing muscles a bit and talk about more serious topics. 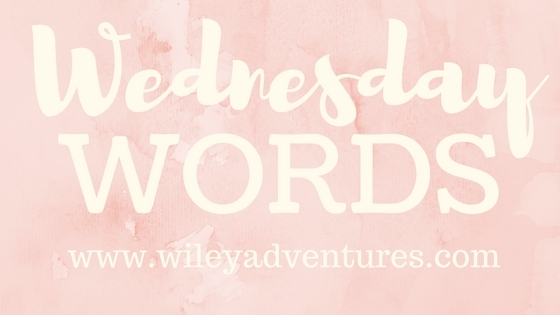 If you have topic suggestions or some things that you'd like to see me write about, feel free to send me an email or leave a comment!